NEW YORK — The new exhibit for NASA's space shuttle Enterprise — opening in New York City Thursday afternoon (July 19) — starts off a bit like a spacewalk. Visitors to the Intrepid Sea, Air and Space Museum don't need to don spacesuits, but they do pass through an airlock into a darkened atmosphere — designed to keep the pressurized display pavilion inflated and to evoke the feeling of being in space. Rising 60 feet (18 meters) above the Intrepid's flight deck — the Intrepid museum is built into the retired U.S.S. Intrepid World War II aircraft carrier — the climate controlled "Space Shuttle Pavilion" displays Enterprise 10 feet (3 meters) off the ground. Its nose propped up such that it is level with the deck, visitors can get an up-close view under and around the original NASA prototype shuttle, similar to how it looked coming in for a touchdown after one of its approach and landing test flights in the late 1970s. "The Intrepid is the only place in the entire world where somebody can come and explore an aircraft carrier, explore a submarine, explore the fastest planes known to mankind — both military and commercial, and now you can explore the first space shuttle. That's a pretty great statement to be able to say," Susan Marenoff-Zausner, president of the Intrepid, told reporters on Wednesday (July 18). 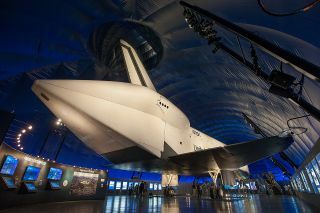 Once inside the pavilion, visitors will find the shuttle Enterprise at center stage, set against dramatic lighting and a series of backlit images and panels. Video stations placed throughout the exhibit are used to explain the roles that the shuttle orbiter served as both an experimental space plane and as an orbital platform enabling a greater understanding of science and technology. "I think they've done real well with what they've put up here," Haise shared with collectSPACE, as he toured the Intrepid's exhibit of his former test craft. "Not just the environment, but the variety of displays that go back to the very first winged vehicles. It is kind of the heritage of the shuttle." A raised platform near Enterprise's front allows visitors to get a better look at the vehicle at eye level, and brings them within just 3 feet (0.9 meters) of its nose. "We have designed this specifically so visitors and students can get as up-close and personal to [Enterprise] as possible," Marenoff-Zausner said. "You can get so close to her nose, it is really incredible." Exhibits surrounding the shuttle highlight the people who were behind its success, while historic photographs and film footage help tell Enterprise's story, first as a test flight vehicle and then as a fit check tool for the launch pad and assembly facilities that supported the shuttle fleet. A short film, narrated by actor Leonard Nimoy of "Star Trek" fame, traces the history of Enterprise and the space shuttle program. Finally, a display of donors' names is presented in a star-themed exhibit, showing the breadth of grassroots support that the Intrepid received for Enterprise's arrival and presence in New York City. NASA awarded the Intrepid with the Enterprise in April 2011, as the space agency was deciding the homes for its space-flown orbiters. The prototype shuttle had been on display at the Smithsonian National Air and Space Museum's Steven F. Udvar-Hazy Center in Virginia, but was moved to Manhattan to make room for the space shuttle Discovery. Enterprise was flown to New York atop the same NASA modified Boeing 747 that supported its 1970s test flights. Touching down at John F. Kennedy International Airport in April, the shuttle completed its journey to the Intrepid by a barge ride up the Hudson River in June. Since then, the museum has been preparing the new pavilion for Thursday's opening. "It is a wonderful moment, as I have been in New York to see her land on the 747, come up the river on a barge, and now see her displayed," Lori Garver, NASA's Deputy Administrator, said. "It was very important to NASA that it be special, and the Intrepid has helped make it so. We're very pleased." To celebrate Enterprise's display, the Intrepid is hosting SpaceFest, a film, music and activity-packed festival with NASA. Both retired and active astronauts, many from the New York area, will meet and greet the public. The SpaceFest, which runs through Sunday (July 22), is sponsored by Samsung Electronics and Time Warner Cable.